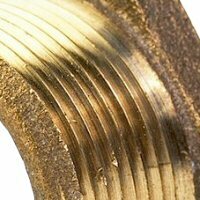 5/16" x 1/8" FNPT Hi-Flow 45° flare connector brass fittings are similar to JIC except for the angle of the flare. Pressure and Vibration: working pressure up to 2000 psi depending on the tube; good vibration resistance. Meets ASA, ASME, SAE and MS specifications and standards.